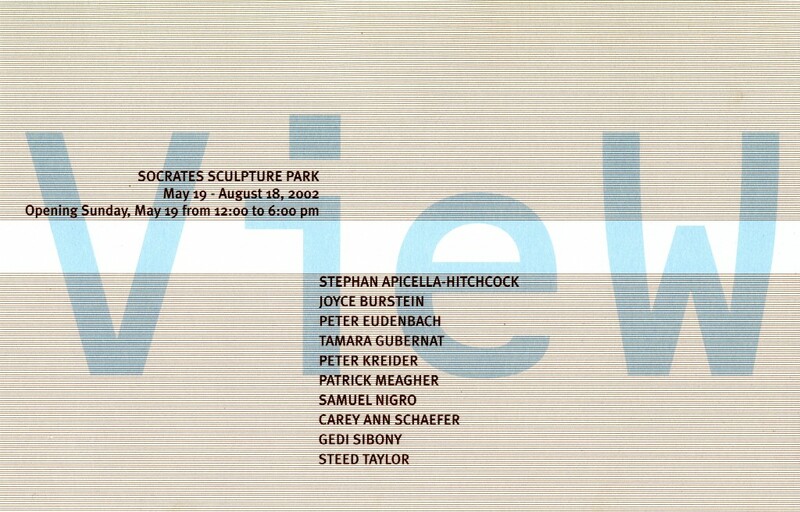 Socrates Sculpture Park will open its 2002 exhibition season with a show featuring ten newly commissioned works: Stephen Apicella-Hitchcok is building a wooden pavilion based on the structure of a roach trap. Joyce Burstein is presenting an edition of her ongoing epitaph project that invites viewers to write in chalk on a slate tombstone. Pater Eudenbach has created a sculpture based on an optical devise pictured in a Durer engraving. Tamara Gubernat has made five iconic flags symbolizing the freedoms guaranteed in the first amendment. Peter Kreider has laid down a small scale, highly detailed highway that references both traditional garden labyrinths and the earthworks of the 1970s. Patrick Meagher’s installation traverses the entire park with lines of cable and EPP foam that make crossing trajectories through the air. Samuel Nigro will present the first two phases on his ongoing manipulation and documentation of a monumental piece of granite, including a performance on the day of the opening. Carey Ann Schaefer has silver leafed areas of the chain link fence that surrounds the Park, transforming it into a shimmering, ephemeral, and unexpectedly beautiful presence. Gedi Sibony has created a sequence of objects, including a ladder hung from a crane and a transplanted tree with a shadow of brick that serve as symbols of life in New York City. Steed Taylor is painting the road — the skin of the community — with a tattoo in honor of grandparents of Long Island City High School students. Also currently on exhibit are two recently completed stainless steel sculptures by Joel Graesser and a billboard by Miles Coolidge that is a large-scale reproduction of a 1909 hand-tinted novelty postcard of The Serpent Mound in Ohio. This exhibition is made possible by the dedication and support of our volunteers and friends and by the generosity of: Lily Auchincloss Foundation, Inc., Carnegie Corporation of New York, The Chase Manhattan Foundation, City Parks Foundation, The Cowles Charitable Trust, Mark di Suvero, Martin and Mildred Friedman, The Horace W. Goldsmith Foundation, The Greenwall Foundation, Agnes Gund and Daniel Shapiro, Wendy Evans Joseph, Richard and Ronay Menschel, Merrill Lynch & Co. Foundation Inc., Ivana Mestrovic, National Endowment for the Arts, New York City Department of Cultural Affairs, New York Foundation for the Arts, New York State Council on the Arts, The Pincus Charitable Fund, The Ross Foundation. Special thanks to the City of New York, Mayor Michael R. Bloomberg, Queens Borough President Helen M. Marshall, City Councilmember Eric Gioia, and the Department of Parks & Recreation, Commissioner Adrian Benepe. Socrates Sculpture Park is grateful for the generosity of: Adirondack, Harold H. Anthony, Inc., John P. Corrieri, Inc., Ex-Tech Industries, Long Island General Supply Co., Materials for the Arts, New York WasteMatch, NOR-COLE, NYC & Co., Plant Specialists, Prest-O-Sales Service, Inc., Spacetime C.C.